Dwellings By DeVore: Happy Thanksgiving! I saw this quote on a church sign on my way to work one day and thought it was good, "Hem your blessings with thankfulness so they don't unravel." 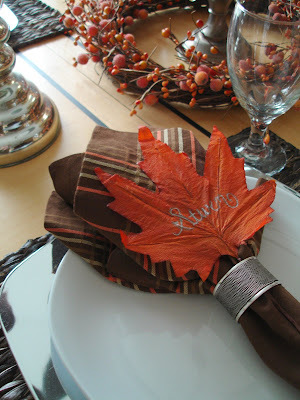 Here is a quick placecard idea with those dollar store leaves I showed you in my first post. I used a silver sharpee, but I think it would be pretty with a gold sharpee too. It's kind of hard to read it in the picture, but it shows up better in person. Hope you all have a wonderful and blessed Thanksgiving!